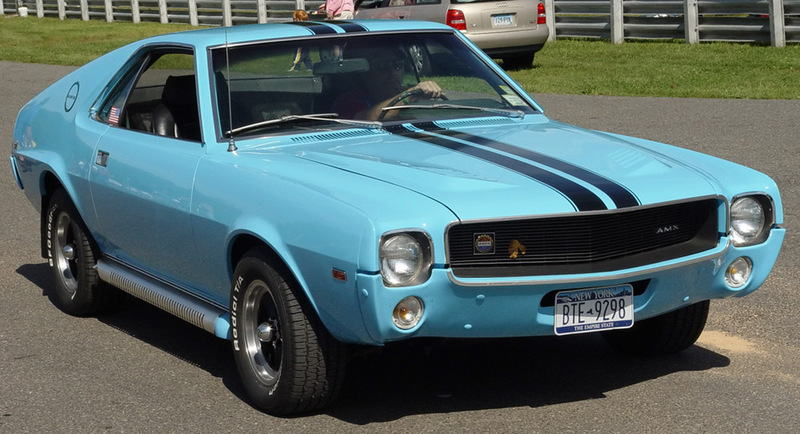 Muscle Car of the Week: 1969 AMC AMX! The ’69 AMX has quite a bit of street cred in the muscle car restoration circles of Southern California. This is namely because, in 1969, AMC decided to release one version of the car strictly for it’s West Coast dealerships! These specially equipped models came with several options that included “trendsetter” sidepipes and brass plaques on the hood blisters. Add 70 degree weather all year long to that equation and you can see why it’s good to be a California native, right? Overall, the cosmetics of the AMX changed only slightly from ’68-’69. Leather seats were now optional for a couple more bucks, and the 5-spoke wheels went from chrome plating to stainless steel. Additionally, the tachometer was moved to match the speedometer, and in mid 1969 a hood was placed over them in front of the driver. One really cool option offered that year was from a selection of “Big Bad” paint jobs. There were three of them: neon blue, green or orange. Less then 700 of these were ordered from the factory so if you can find one of them somewhere you shouldn’t hesitate to make it your auto restoration project. There were three engine sizes available in 1969. The biggest was a 390 cubic inch beast that delivers around 315 horsepower after some chassis dyno tuning. There were, however, 52 ‘Super Stock’ AMXs built in ’69 as well. These were mainly built for the drag strip and came stocked with a 390 cubic inch engine and twin Holley carburetors in order to maximize their quarter mile performance. These 52 automobiles are extremely rare and highly sought after in every auto restoration circle around. If you find one, let us know! Today you can get an average AMX for around $6000 and, in excellent condition, sell it for around $23K!